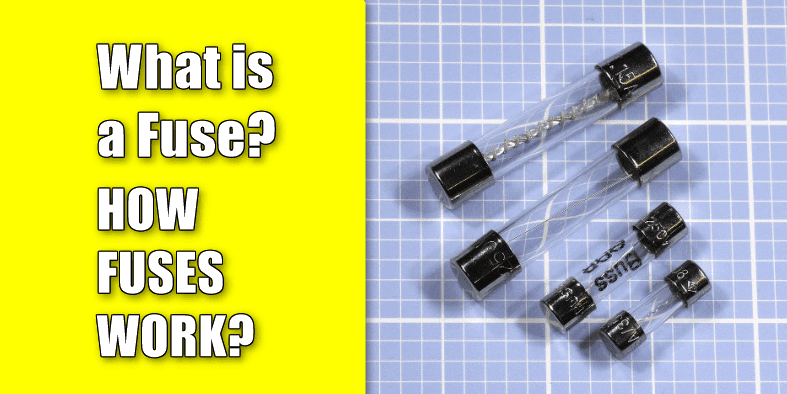 What is a FUSE and How it Works? A fuse protects an electrical circuit or device from excessive current when a metal element inside it melts to create an open circuit. In this post, we will look in to the construction and working of Fuse and the properties of fuse material. With the excep­tion of resettable fuses, a fuse must be dis­carded and replaced after it has fulfilled its func­tion. A fuse can work with either AC or DC voltage and can be designed for almost any current. In residential and commercial buildings, circuit break­ers have become common, but a large cartridge fuse may still be used to protect the whole sys­tem from short-circuits or from overcurrent caused by lightning strikes on exposed power lines. In electronic devices, the power supply is al­most always fused. 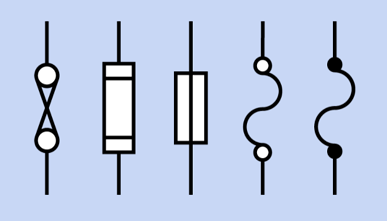 Schematic symbols for a fuse are shown in the figure. Those at the right and second from right are most frequently used. The one in the center is approved by ANSI, IEC, and IEEE but is seldom seen. To the left of that is the fuse symbol understood by electrical contractors in architec­tural plans. The symbol at far left used to be com­mon but has fallen into disuse. The element in a fuse is usually a wire or thin metal strip mounted between two terminals. In a cartridge fuse, it is enclosed in a glass or ceramic cylinder with a contact at each end, or in a small metallic can. (Old-style, large, high-amperage fuses may be packaged in a paper or cardboard tube.) The traditional glass cartridge allows the vis­ual inspection to confirm that the fuse has blown. A fuse responds only to current, not to voltage. When choosing a fuse that will be reliable in conditions of steady current consumption, a safe rule is to figure the maximum amperage when all components are functioning and add 50%. How­ever, if current surges or spikes are likely, their duration will be relevant. Some semiconductors also have an I2t rating and should be protected with a similarly rated fuse. Any fuse will present some resistance to the cur­rent flowing through it. Otherwise, the current would not generate the heat that blows the fuse. Manufacturer datasheets list the voltage drop that the internal resistance of a fuse is likely to introduce into a circuit. The typical fuse consists of an element which is surrounded by a filler and enclosed by the fuse body. The element is welded or soldered to the fuse contacts (blades or ferrules). The element provides the current path through the fuse. It generates heat at a rate dependent on its resistance and the load current. The heat generated by the element is absorbed by the filler and passed through the fuse body to the surrounding air. The filler material, such as quartz sand, provides effective heat transfer and allows for the small element cross-section typical in modern fuses. The effective heat transfer allows the fuse to carry harmless overloads. The small element cross section melts quickly under short-circuit conditions. The filler also aids fuse performance by absorbing arc energy when the fuse clears an overload or short circuit. When a sustained overload occurs, the element will generate heat at a faster rate than the heat can be passed to the filler. If the overload persists, the element will reach its melting point and open. Increasing the applied current will heat the element faster and cause the fuse to open sooner. Thus, fuses have an inverse time-current characteristic: that is, the greater the overcurrent, the less time required for the fuse to open the circuit. This characteristic is desirable because it parallels the characteristics of conductors, motors, transformers, and other electrical apparatus. These components can carry low-level overloads for relatively long periods without damage. However, under high-current conditions, damage can occur quickly. Because of its inverse time-current characteristic, a properly applied fuse can provide effective protection over a broad current range, from low-level overloads to high-level short circuits.